At www.malwaretips.com - This is a guide to using the Windows System Restore tool to remove the infection. At www.bleepingcomputer.com - This is a step-by-step guide showing how to use Rkill will try to disarm the infection. Both these are do-it-yourself free ways to remove the infection. If they seem too confusing, please look to an IT professional for assistance. Also, do try have the latest and best Windows OS anti-virus installed and running at all times. Others have posted some ideas at this Yahoo website. 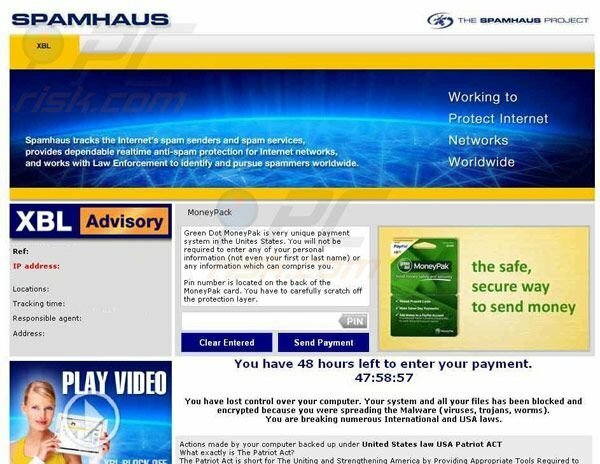 This "Spamhaus branded" ransomware was first spotted by Spamhaus over a year ago. We are also working to have this version's Command & Control server at "xblblock.com" shut down.